- According to cake discharging type: automatic and manual. - According to pressing type: automatic and manual. - According to material of plate: polypropylene, membrane and stainless steel. 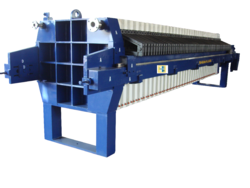 Membrane Filter Press are generally used for Separating Solids from a liquid slurry o the maximum extend possible. In The Membrane chamber the filtered Cake will be squeezed further under high pressure. During the squeezing process the remaining moisture retained in the cake shall be drained to the maximum extend possible. We are engaged in manufacturing and supplying a wide range of Membrane Plate Filter Press. The Membrane Plate Filter Press has proved to be useful in certain applicalions, Iypical of which filtration of dyes, pigments and yeast slurries. Further information given here on page 6. We make available in the market a high quality Membrane Filter Press Fabric that handles squeezing pressure up to 30 bars and backwash pressure up to 100 bars. Manufactured as per the International Standards, our Membrane Filter Press Fabric assures high durability and reliability. For catering the variegated needs of our clients, we are deeply engrossed in offering a qualitative array of Membrane Filter Press Machine. We are involved in providing optimum quality Membrane Filter Press to our most reliable clients. These Membrane Filter Press are appreciated by large number of clients due to excellent quality and durability. 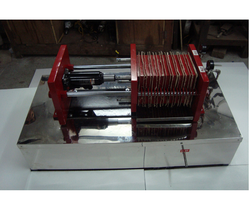 These Membrane Filter Press are available in market at most affordable prices.